The generation, linking and analysis of huge amounts of data (often described as “Big Data”) is rapidly gaining importance in almost all areas of life. The generation, linking and analysis of huge amounts of data (often described as “Big Data”) is rapidly gaining importance in almost all areas of life. In recent years, data sources have multiplied due to an extensive use of networked computer technologies. These range from smartphones, social networks and surfing habits up to the networking of everyday live – the latter made possible through advances in the Internet of Things (e.g., smart wearables, watches, buildings, and electric supply networks). At the same time, the possibility to link these data sources and advances in the development of hard- and software technologies have brought about new possibilities of data evaluation affecting almost all areas of human life and the economic sectors. This development raises questions that are highly relevant for society, for example, concerning commercial or state surveillance, the protection of privacy and informational self-determination, problems of a lack of transparency, abuse or errors in data management or in automated decision-making. A public debate about the balance between using the potential of Big Data innovations on the one hand and individual and societal values on the other hand has only recently begun. The project contributes to the debate through a series of joint research processes, including social dialogue instruments. Therewith, it is intended to collect, create, deepen and disseminate knowledge about Big Data and its use. Within the project, the complex and often opaque developments in Big Data applications, data flows and business models will be continuously monitored, recorded and assessed. To determine and assess societal changes associated with Big Data, interdisciplinary in-depth studies will be set up, taking into account the findings and results of expert workshops and focus groups. In order to understand citizens’ estimations and expectations, three citizens’ consultations will be held and a representative population survey will be carried out. The so far fragmented scientific knowledge will be brought together, further developed and shared across the different fields of social science research. It will then be used to assess specific Big Data developments. Specially established working groups in the fields of ethics, economics, sociology, law, and political science support this aim. Additionally, a nationwide symposium will be organized which offers opportunities for exchange to stakeholders working in research and development. 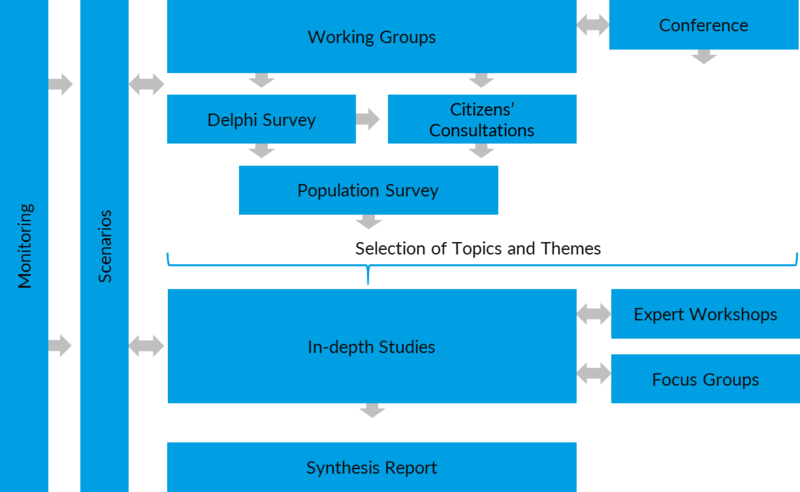 Finally, the results of the whole set of research activities and the assessment and discussion of future developments in scenarios and in an expert Delphi workshop will be used to develop options for political action, research and development. Structure and execution of the research- and dialogue-oriented instruments and work packages.